A host of State Ceremonial events are taking place throughout 2016 to commemorate the events of 1916, find out more below. Tá carn imeachtaí Searmanais Stáit ar siúl i rith 2016 chun comóradh a dhéanamh ar imeachtaí 1916. Tá níos mó eolais le fáil thíos. This is a special ceremony for post-primary schools and, as such, is not open to the public to attend. This ceremony will take place in collaboration with the Thomas F. Meagher Foundation. Students will be invited to Croke Park for a special ceremony where they will be presented with the National Flag and copies of the Proclamation by members of the Defence Forces. The ceremony will include a special address from President Higgins. An actor portraying Thomas Francis Meagher will give a dramatic account of the story of his life. A video will also be shown, which will illustrate the peaceful message of the National Flag and the pride and affection felt by Irish people at home and abroad. Is searmanas speisialta é seo le haghaidh iar-bhunscoileanna agus, dá bhrí sin, ní bheidh an pobal i láthair. Beidh an searmanas seo ar siúl i gcomhar leis an Thomas F. Meagher Foundation. Tabharfar cuireadh do scoláirí chuig Páirc an Chrócaigh le haghaidh searmanas speisialta áit a mbronnfaidh baill d’Óglaigh na hÉireann an Bhratach Náisiúnta agus cóipeanna den Fhorógra orthu. Beidh aitheasc speisialta ón Uachtarán Ó hUiginn mar chuid den searmanas. Tabharfaidh aisteoir a bheidh i gcarachtar Thomas Francis Meagher cuntas drámata ar a shaol. Taispeánfar físeán freisin, a léireoidh teachtaireacht shíochánta Bhratach na hÉireann agus an mórtas agus an gean atá ag muintir na hÉireann uirthi sa bhaile agus thar lear. This event is open to the public who will be able to view proceedings on a large screen in the square. As space will be limited a ticketing system will be used to assist members of the public who would like to attend. Commemoration event to highlight the significant role played by women in the 1916 Rising. This important event will take place on International Women's day, the State will commemorate the role of women in 1916 with a keynote address by President Higgins and a special performance of music and song on the theme of ‘Women in 1916'. There will also be a film screened, which will illustrate contemporary stories to illustrate influential Irish women today as well as elements of community projects, including the Richmond Barracks community quilt project. After the conclusion of the formal ceremony, those present will be able to view a street theatre performance by a local community women's group. An exhibition will also be on display, which invited guests will be able to view before and after the ceremony. More information on this process will follow. Beidh fáilte roimh an bpobal chuig an imeacht seo, agus beidh siad in ann na himeachtaí a fheiceáil ar scáileán mór sa chearnóg. Ní bheidh ach líon teoranta spásanna ar fáil mar sin úsáidfear córas ticéadaithe chun cabhrú le daoine ar mhaith leo freastal air. Ócáid chomórtha chun aird a tharraingt ar an ról mór a bhí ag na mná in Éirí Amach 1916. Beidh an ócáid thábhachtach seo ar siúl ar lá Idirnáisiúnta na mBan, agus déanfaidh an Stát comóradh ar ról na mban i 1916 le spreagaitheasc ón Uachtarán Ó hUiginn agus le taibhiú speisialta ceoil agus amhrán ar an téama ‘Mná i 1916’. Cuirfear scannán i láthair freisin, a léireoidh scéalta comhaimseartha chun léiriú a thabhairt ar mhná Éireannacha a bhfuil tionchar mór acu sa lá atá inniu ann, chomh maith le gnéithe de thionscadail phobail, lena n-áirítear tionscadal cuilte pobail Bheairic Richmond. Nuair a bheidh an comóradh foirmiúil thart, beidh na daoine a bheidh i láthair in ann taibhiú téatair sráide a fheiceáil ó ghrúpa pobail ban. Beidh taispeántas ann freisin, a fheicfidh aíonna a gheobhaidh cuireadh chuig an ócáid roimh an searmanas agus ina dhiaidh. Beidh tuilleadh eolais ar fáil faoin bpróiseas seo níos déanaí. A remembrance ceremony for all those who died during the events of 1916 will be held in the Garden of Remembrance. The event will have a cultural element with music and poetry included. This is a ceremony in two parts to remember and honour those who gave their lives in the cause of Irish Freedom. The ceremony will open with a cultural piece, which will include readings, music and poetry. A plaque will be unveiled, which will be inscribed with a specially commissioned poem to commemorate the centenary of the 1916 Easter Rising. The second half of the ceremony comprises the formal State Commemoration of the Irish Volunteers, who gave their lives during the Rising. It will include a solemn wreath-laying ceremony followed by a minute of silent reflection and a piper's lament, and the raising of the National Flag to full mast. Is le cuireadh amháin a cheadófar isteach thú chuig an imeacht seo. Beidh searmanas cuimhneacháin do gach duine a fuair bás le linn imeachtaí 1916 ar siúl sa Ghairdín Cuimhneacháin. Beidh cultúr le sonrú san ócáid lena n-áireofar ceol agus filíocht. Beidh dhá chuid sa searmanas seo a chuimhneoidh orthu siúd a fuair bás ar son shaoirse na hÉireann agus a thabharfaidh onóir dóibh. Osclófar an searmanas le blaisín cultúrtha, lena n-áireofar léamha, ceol agus filíocht. Nochtfar plaic ar a ngreanfar dán arna choimisiúnú go speisialta chun comóradh céad bliain Éirí Amach 1916 a cheiliúradh. Déanfar Comóradh Stáit foirmiúil ar Óglaigh na hÉireann a fuair bás le linn an Éirí Amach sa dara leath den searmanas. Beidh searmanas sollúnta fleascleagain, nóiméad machnaimh chiúin agus caoineadh píobaire i gceist agus ardófar an Bhratach Náisiúnta ar lánchrann. A State event for relatives of those who took part in the events of 1916 will be led by the relatives and will be a respectful evening for families to reflect on the involvement of their ancestors and to mark the events of 1916. The event will have a cultural and historical element. Beidh ócáid Stáit do ghaolta na ndaoine a ghlac páirt in imeachtaí 1916 á stiúradh ag na gaolta agus beidh sé ina thráthnóna ómósach do theaghlaigh chun machnamh a dhéanamh ar rannpháirtíocht a sinsear agus chun imeachtaí 1916 a chomóradh. Beidh gné chultúrtha agus stairiúil san ócáid. This event is open to the public who will be able to view the parade all along the parade route. Large screens will also be available to assist viewing. A reading of the 1916 Proclamation and a parade will take place on Easter Sunday. The ceremony will begin with the reading of the 1916 proclamation, under the GPO Portico, by a Defence Forces officer. 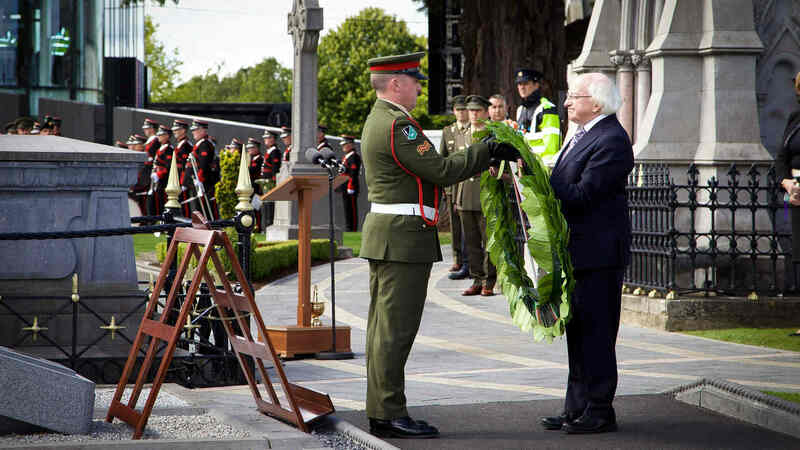 The President will lay a wreath on behalf of the people of Ireland, followed by a minute's silence for all those who died. The National Flag on top of the GPO will then be raised to full mast and the ceremony will conclude with the playing of the National Anthem. The parade which will be led by the Defence Forces will follow the ceremony and commence at St. Stephen's Green. Beidh fáilte roimh an bpobal chuig an imeacht seo agus beidh siad in ann an pharáid a fheiceáil feadh bhealach na paráide. Beidh scáileáin mhóra ar fáil freisin. Léifear Forógra 1916 agus beidh mórshiúl ann Domhnach Cásca. Léifidh Oifigeach de chuid Óglaigh na hÉireann Forógra 1916 ag tús an tsearmanais faoi Phóirseáid Ard-Oifig an Phoist. Leagfaidh an tUachtarán fleasc thar ceann mhuintir na hÉireann. Beidh nóiméad ciúnais ina dhiaidh sin do gach duine a fuair bás. Ardófar an Bhratach Náisiúnta ar mhullach Ard-Oifig an Phoist ar lánchrann ansin agus casfar Amhrán na bhFiann ag deireadh an tsearmanais. Tosóidh an mórshiúl ag Faiche Stiabhna tar éis an tsearmanais. Beidh Óglaigh na hÉireann ar a cheann. This event is invitation only and not open to the public. A State Reception in Dublin Castle will take place, at the Taoiseach’s invitation, for the guests invited to the Easter Sunday parade. Entertainment will take place based on the Ireland 2016 themes of Remember, Reflect and Reimagine. Is trí chuireadh amháin atá an t-imeacht seo á eagrú, agus ní bheidh sé oscailte don phobal. Reáchtálfar Fáiltiú Stáit i gCaisleán Bhaile Átha Cliath, ar chuireadh ón Taoiseach, d’aíonna a fuair cuireadh chuig mórshiúl Dhomhnach Cásca. Beidh an tsiamsaíocht bunaithe ar théamaí Éire 2016: Cuimhnigh, Machnaigh agus Athshamhlaigh. This event is open to the public, who will be able to view proceedings on a large screen in the public area. Space will be limited so a ticketing system will be used to assist members of the public who would like to attend. More information on this process to follow. On Easter Sunday morning there will be a three-part wreath-laying ceremony in Glasnevin Cemetery. The first wreath will be laid at the Sigerson Monument for all who served during Easter Week. The second will be laid at the grave of Edward Hollywood, who was the weaver of the first Irish Tricolour in 1848. The ceremony will close with the final wreath being laid at the grave of Peadar Kearney, who wrote the lyrics to the Soldier's Song - Amhrán na bhFiann. Beidh fáilte roimh an bpobal chuig an imeacht seo, agus beidh siad in ann na himeachtaí a fheiceáil ar scáileán mór sa limistéar poiblí. Ní bheidh ach líon teoranta spásanna ar fáil mar sin úsáidfear córas ticéad chun cabhrú le daoine a mbeadh fonn orthu freastal. Beidh searmanas fleascleagain lena ngabhfaidh trí chuid ar siúl maidin Dhomhnach Cásca i Reilig Ghlas Naíon. Leagfar an chéad fhleasc ag Séadchomhartha Sigerson do gach duine a rinne seirbhís le linn Sheachtain na Cásca. Leagfar an dara fleasc ag uaigh Edward Hollywood, fíodóir chéad-Bhratach na hÉireann sa bhliain 1848. Dúnfar an searmanas leis an bhfleascleagan deireanach ag uaigh Peadar Kearney, an duine a scríobh liricí an amhráin, The Soldier’s Song (Amhrán na bhFiann). Numbers at this event will be small and it is not open the public. A formal State ceremony will take place in Kilmainham Gaol for 35 guests at 10:30am. This ceremony will take place in Stone Breakers Yard on the site where the 1916 leaders were executed in Kilmainham Gaol. The ceremony will include a solemn wreath-laying by the President. This will be followed by a minute of silent reflection, the sounding of the Last Post and the raising of the National flag to full mast. Ní bheidh ach líon beag daoine ag an imeacht seo agus ní bheidh an pobal i láthair. Beidh searmanas foirmiúil Stáit ar bun i bPríosún Chill Mhaighneann le haghaidh 35 aoi ag 10:30am. Beidh an searmanas seo ar siúl i gClós na mBristeoirí Cloch ar an láthair inar cuireadh ceannairí 1916 chun báis i bPríosún Chill Mhaighneann. Beidh searmanas sollúnta fleascleagain ann leis an Uachtarán. Beidh nóiméad machnaimh chiúin ina dhiaidh sin, séidfear an Ghairm Dheiridh agus ardófar an Bhratach Náisiúnta ar lánchrann. All ceremonies are open to the public. Synchronised wreath-laying ceremonies will be held at 1.15pm – the time that the first shots of the 1916 Rising were fired - at strategic points around Dublin and other key regional areas, starting at Dublin Castle. Different ceremonies will be held at each site according to the significance of the site in the events in 1916. Other events may be developed in conjunction with local authorities over the course of the programme. The Dublin wreath laying ceremonies will take place at Boland’s Mills, Jacob’s Factory, Dublin Castle, The Four Courts, Royal College of Surgeons and Moore Street. Ceremonies will also take place in Meath, Galway, Cork, and Wexford. The Meath Ceremony will begin at 11.am at Rathcross in Ashbourne. This event opens with a re-enactment of the Battle of Ashbourne and is followed by a formal State Ceremonial commemoration of the centenary of the Battle of Ashbourne, including a wreath-laying ceremony at 1.15.pm to be synchronised with the other wreath-laying ceremonies taking place that day. The Galway Ceremony will begin at 11.45 and will take place in Athenry Town Park. This event will begin with a formal State Ceremonial commemoration to acknowledge the significant role played by the people of Galway in the events of the Rising. The wreath will also be laid by a member of Government at 1.15.pm in synchronisation with the other ceremonies around the country. This event will also include poetry, music, a re-enactment relevant to the events of Easter week and a parade of representatives from each of the county’s GAA clubs. The Cork ceremony will comprise of two parts. Part one will begin at 9.45am at County Hall and part two, the main ceremony will begin on Grand Parade in Cork City, with elements also taking place at County Hall and at St. Francis Hall on Sheares Street. The event will open with a procession of various groups from around the county who will assemble at County Hall, where a commemorative plaque will be unveiled. The procession will be joined by representatives from Cork City Council at St. Francis Hall on Sheares Street, where there will be another commemorative plaque unveiled. The group will then proceed to Grand Parade for the formal State Ceremonial commemoration to acknowledge the significant role played by the people of Cork in the events of the Rising. This will be followed by the synchronised laying of the wreath at 1.15.pm. Following the conclusion of the formal State Ceremonial event, a public celebration will take place which will re-enact the times of 1916. The Wexford Ceremony will begin at 11:00 a.m at Abbey Square, Enniscorthy. This event will begin with a 1916 Centenary Parade from St. Aidan's Cathedral to the Seamus Rafter Statue in Abbey Square. Following the parade, the formal State commemoration will begin and two wreaths will be laid at 1.15pm. The ceremony will include music and song and will close with a 1916 battle re-enactment in the Abbey Square Car Park. Beidh fáilte roimh an bpobal chuig na searmanais go léir. Beidh searmanais fleascleagain chomhthrátha ar siúl ag 1.15pm – an t-am ar scaoileadh na chéad urchair in Éirí Amach 1916 – agus tarlóidh siad ag pointí straitéiseacha thart timpeall Bhaile Átha Cliath agus i bpríomháiteanna réigiúnacha eile, ag tosú i gCaisleán Bhaile Átha Cliath. Beidh searmanais dhifriúla ar siúl i ngach láthair de réir thábhacht na láithreach in imeachtaí 1916. Féadfar imeachtaí eile a eagrú i gcomhar le húdaráis áitiúla i rith an chláir. Beidh searmanais fleascleagain Bhaile Átha Cliath ar siúl ag Muilte Uí Bheoláin, Monarcha Jacob, Caisleán Bhaile Átha Cliath, na Ceithre Chúirt, Coláiste Ríoga na Máinlianna agus ar Shráid an Mhúraigh. Beidh searmanais ar siúl freisin sa Mhí, i nGaillimh, i gCorcaigh, agus i Loch Garman. Tosóidh Searmanas na Mí ag 11.00am ag Rathcross i gCill Dhéagláin. Cuirfear tús leis an imeacht sin le hathléiriú ar Chath Chill Dhéagláin agus ina dhiaidh sin beidh Searmanas Stáit ar siúl mar chomóradh foirmiúil ar chéad bliain a bheith imithe tharainn ó tharla Cath Chill Dhéagláin. Mar chuid de, beidh searmanas fleascleagain ar siúl ag 1.15pm i gcomhthráth leis na searmanais fleascleagain eile a bheidh á reáchtáil an lá sin. Cuirfear tús le Searmanas na Gaillimhe ag 11.45 agus beidh sé ar siúl i bPáirc Bhaile Átha an Rí. Cuirfear tús leis an imeacht le Searmanais Stáit chun comóradh foirmiúil a dhéanamh ar an ról suntasach a bhí ag muintir na Gaillimhe in imeachtaí an Éirí Amach. Leagfaidh ball den Rialtas fleasc freisin ag 1.15pm i gcomhthráth leis na searmanais eile timpeall na tíre. Mar chuid de na himeachtaí beidh filíocht, ceol, athléiriú ar imeachtaí a bhain le seachtain na Cásca agus paráid ina mbeidh ionadaithe ó gach ceann de chlubanna CLG na Gaillimhe. Beidh dhá chuid ag baint le searmanas Chorcaí. Cuirfear tús le cuid a haon ag 9.45am ag Halla an Chontae agus cuirfear tús le cuid a dó, an príomhshearmanas, ar Shráid an Chapaill Bhuí i gCathair Chorcaí, agus beidh roinnt imeachtaí ar siúl freisin ag Halla an Chontae agus ag Halla Naomh Proinsias ar Shráid na Síorach. Cuirfear tús leis an imeacht le mórshiúl de ghrúpaí éagsúla ón gcontae ar fad a chruinneoidh le chéile ag Halla an Chontae, áit a nochtfar plaic chomórtha. Rachaidh ionadaithe ó Chomhairle Cathrach Chorcaí ar an mórshiúl ag Halla Naomh Proinsias ar Shráid na Síorach, áit a nochtfar plaic chomórtha eile. Rachaidh an grúpa ar aghaidh ansin chomh fada le Sráid an Chapaill Bhuí le haghaidh an tSearmanais Stáit ina ndéanfar comóradh foirmiúil mar aitheantas ar an ról suntasach a bhí ag muintir Chorcaí in imeachtaí an Éirí Amach. Leagfar an fleasc ina dhiaidh sin ag 1.15pm i gcomhthráth leis na searmanais fleascleagain eile. Tar éis an Comóradh foirmiúil Stáit a chur i gcrích, beidh ceiliúradh poiblí ar siúl a dhéanfaidh athléiriú ar 1916. Cuirfear tús le Searmanas Loch Garman ag 11:00am i gCearnóg na Mainistreach, Inis Córthaidh. Tosóidh an ócáid sin le Paráid Chomórtha 1916 ó Ard-Eaglais Naomh Aodhán go dtí Dealbh Shéamuis Rafter ar Chearnóg na Mainistreach. I ndiaidh na paráide, cuirfear an comóradh foirmiúil Stáit ar bun agus leagfar dhá fhleasc ag 1.15pm. Beidh ceol agus amhráin mar chuid den searmanas agus cuirfear deireadh leis na himeachtaí le hathléiriú ar chath 1916 i gCarrchlós Chearnóg na Mainistreach. These events are open to the public and a small number of seats will be provided at each location for those who require one. Synchronised wreath-laying ceremonies will take place at six iconic sites associated with the Easter Rising in Dublin. Wreaths will be laid in the following locations: Boland's Mill; Jacobs Factory; Dublin Castle; The Four Courts; Royal College of Surgeons; and Moore Street. A Minister will open each ceremony with a brief explanation of the significance of each of the locations in the Rising. Two wreaths will be laid at each location at precisely 1.15 p.m., the time when the first shots of the Rising were fired. The wreath-laying ceremonies will incorporate a formal military ceremonial element and a minute of silent reflection. Cuirfear fáilte roimh an bpobal chuig na himeachtaí seo agus cuirfear líon beag suíochán ar fáil i ngach áit dóibh sin a dteastóidh siad uathu. Beidh searmanais fleascleagain chomhthrátha ar siúl ag sé láithreán mór le rá a bhfuil ceangal acu le hÉirí Amach na Cásca i mBaile Átha Cliath. Leagfar fleasca ag na háiteanna seo a leanas: Muilte Uí Bheoláin; Monarcha Jacob; Caisleán Bhaile Átha Cliath; na Ceithre Chúirt; Coláiste Ríoga na Máinlianna; agus Sráid an Mhúraigh. Osclóidh Aire gach searmanas le míniú gairid ar thábhacht gach ceann de na háiteanna san Éirí Amach. Leagfar dhá fhleasc ag gach áit cruinn díreach ag 1.15pm, an t-am ar scaoileadh na chéad urchair san Éirí Amach. Mar chuid de na searmanais fleascleagain reáchtálfar searmanas foirmiúil míleata agus nóiméad machnaimh chiúin. There will be public standing areas where members of the public can view the proceedings on large screens. A formal State Ceremony will take place to commemorate the role of The Irish Citizen Army and James Connolly in the events of 1916. There will be three main parts to this event. It will begin with a wreath-laying ceremony at the statue of James Connolly. This will be followed by a re-enactment of the raising of the flag of the Irish Republic, and will commence with readings, music and poetry in the auditorium of Liberty Hall. Beidh limistéir phoiblí ann ina bhféadfaidh daoine seasamh agus féachaint ar na himeachtaí ar scáileáin mhóra. Reáchtálfar Searmanas Stáit foirmiúil chun comóradh a dhéanamh ar ról Arm Cathartha na hÉireann agus Shéamais Uí Chonghaile in eachtraí 1916. Beidh trí phríomhchuid san ócáid seo. Beidh searmanas fleascleagain ag dealbh Shéamais Uí Chonghaile i dtús báire. Déanfar athléiriú ar ardú bhratach Phoblacht na hÉireann ina dhiaidh sin, agus cuirfear tús le léamha, le ceol agus le filíocht i halla éisteachta Halla na Saoirse. This event will be open to the public in a designated area with a viewing screen however, seating will be limited. An interfaith service will be held at the Remembrance Walls at Glasnevin Cemetery adjacent to the graves of Ireland’s leaders. This service will involve participation and representation by the main faith organisations where all those who lost their lives during the Easter Rising, including civilian dead, will be remembered. This service has been conceived by Glasnevin Trust, to remember all of the casualties of the Easter Rising. Beidh fáilte roimh an bpobal chuig an imeacht seo i limistéar ainmnithe le scáileán amhairc, ach ní bheidh ach líon teoranta suíochán ar fáil. Beidh seirbhís idirchaidrimh ag na Ballaí Cuimhneacháin i Reilig Ghlas Naíon in aice le huaigheanna cheannairí na hÉireann. Glacfaidh na príomheagraíochtaí creidimh páirt agus déanfar ionadaíocht thar a gceann sa tseirbhís ina gcuimhneofar ar gach duine a cailleadh i rith an Éirí Amach, lena n-áirítear sibhialtaigh a bhásaigh. Is iad Iontaobhas Ghlas Naíon a cheap an tseirbhís, chun cuimhneamh ar na daoine ar fad a fuair bás i rith an Éirí Amach. A commemorative event will take place to mark the journey of reconciliation from Easter 1916 to Easter 2016, noting the importance of the Good Friday Agreement. Beidh ócáid chomórtha ar siúl chun an turas athmhuintearais ó Cháisc 1916 go Cáisc 2016 a chomóradh, ina sonrófar an tábhacht a bhaineann le Comhaontú Aoine an Chéasta. This event will be open to the public. Ballykissane Pier can accommodate a small number of people and Banna Strand will have designated public standing areas. There will be two commemorative events for Sir Roger Casement on Thursday 21st of April. Sir Roger Casement was captured by the RIC on Banna Strand, where he had been landed by a German U–Boat. He was then imprisoned in England. Subsequently, Casement was tried and sentenced to death. The first event will take place at Ballykissane Pier at 8am to commemorate the tragic events that occurred there. The second event will take place at Banna Strand at noon and will begin with readings and a cultural element. The formal State Ceremonial commemoration will then commence. Casement’s U-boat arrived at Tralee Bay on 20 April 1916 (Holy Thursday), but there was no sign of the ‘Aud’, which was to land the German guns. In the early hours of 21 April 1916, Casement came ashore at Banna Strand. Casement’s landing in Banna was one of the few significant events of the Easter Rising to happen outside of the capital, and it had a national and international impact. Too weak to travel, he was discovered at McKenna’s Fort and brought under guard to Tralee before being removed to Dublin and later London. The ceremony will also feature a reading of Casement’s speech by a professional actor, an introduction to Casement the man behind the politics, and a performance by the National Folk Choir from Siamsa Tire. The event will be attended by members of the Defence Forces, local and national political representatives, family descendants, and members of the local community. Beidh fáilte roimh an bpobal chuig an imeacht seo. Beidh líon beag daoine in ann dul ar Ché Bhaile Uí Chosáin agus beidh limistéir phoiblí ar Thrá na Beannaí áit a mbeidh daoine in ann seasamh. Eagrófar dhá imeacht comórtha don Sir Ruairí Mac Easmainn Déardaoin an 21 Aibreán. Ghabh Constáblacht Ríoga na hÉireann Sir Ruairí Mac Easmainn ar Thrá na Beannaí, áit ar tháinig sé i dtír i bhfomhuireán Gearmánach. Cuireadh i bpríosún i Sasana é ansin. Cuireadh ar a thriail é ina dhiaidh sin agus daoradh chun báis é.
Tosóidh an chéad ócáid ag Cé Bhaile Uí Chosáin ar 8am chun na heachtraí tubaisteacha a tharla ansin a chomóradh. Beidh an dara hócáid ar siúl ag Trá na Beannaí ag meán lae agus beidh léamha agus blaisín cultúrtha ann ag an tús. Tosóidh an comóradh foirmiúil Searmanais Stáit ina dhiaidh sin. Tháinig U-Bhád Casement i dtír ag Cuan Thrá Lí an 20 Aibreán 1916 (Déardaoin Naofa), ach ní raibh dé ar an ‘Aud’, a bhí chun gunnaí a thabhairt i dtír ón nGearmáin. Moch maidin an 21 Aibreán 1916, tháinig Casement i dtír ar Thrá na Beannaí. Bhí teacht i dtír Casement ar Thrá na Beannaí ar cheann de na cúpla imeacht ba shuntasaí d’Éirí Amach na Cásca a tharla lasmuigh den phríomhchathair, agus bhí tionchar náisiúnta agus idirnáisiúnta aige. Bhí sé ró-lag le dul in aon áit, agus thángthas air i nDún Mhic Cionaoith agus tugadh faoi gharda é go Trá Lí sular tugadh chun bealaigh go Baile Átha Cliath agus go Londain é ina dhiaidh sin. Léifidh aisteoir gairmiúil píosa as óráid Casement freisin ag an searmanas, cuirfear in aithne Casement, an duine, gan aon tagairt do chúrsaí polaitíochta, agus seinnfidh an Cór Náisiúnta Pobail ó Shiamsa Tíre. Freastalóidh baill d’Óglaigh na hÉireann, ionadaithe polaitiúla áitiúla agus náisiúnta, daoine muinteartha na dteaghlach, agus an pobal áitiúil ar an ócáid. No seating will be available to the public inside the Church however, screens will be provided for public viewing outside. A commemorative event will take place at Arbour Hill. A Requiem Mass will be held in the Church of the Most Sacred Heart, Arbour Hill followed by a procession to the adjoining graveside of 14 leaders of the Easter Rising. There will be a ceremony, including interfaith prayers at the graveside and a wreath-laying by the President of Ireland. Ní bheidh aon suíocháin ar fáil don phobal laistigh den Séipéal, ach cuirfear scáileáin ar fáil lasmuigh don phobal. Beidh ócáid chomórtha ar siúl ag Cnoc an Arbhair. Beidh Aifreann Éagnairce ar siúl i Séipéal an Chroí Rónaofa, Cnoc an Arbhair agus ina dhiaidh rachaidh mórshiúl chuig na huaigheanna in aice láimhe ina bhfuil 14 cheannaire an Éirí Amach curtha. Beidh searmanas ansin, lena n-áirítear paidreacha idirchreidimh ag an uaigh agus leagfaidh Uachtarán na hÉireann fleasc. Due to the size of the venue this event will not be open to the public. Ceremony to mark the official opening of a newly constructed building at the Military Archives and the refurbishment of an adjoining building to facilitate visitor access to the Military Archives. This new facility will provide a front of house facility, a new purpose built annex building to provide file storage with enhanced access to physical files of the Military Pensions Archive. There will be an official ribbon cutting ceremony at the site of the new building and wreath laying ceremony followed by a minute's silence and a piper's lament at the site of the executions. Ní bheidh an pobal i láthair ag an ócáid toisc an t-ionad a bheith róbheag. Searmanas chun ceiliúradh a dhéanamh ar oscailt oifigiúil foirgnimh nuathógtha ag na Cartlanna Míleata agus ar athchóiriú foirgnimh in aice láimhe d’fhonn rochtain cuairteoirí ar na Cartlanna Míleata a éascú. Beidh áis fáiltithe sa tsaoráid nua, foirgneamh nua breise saincheaptha chun comhaid a stóráil ann agus rochtain fheabhsaithe ar chomhaid fhisiceacha Chartlann na bPinsean Míleata. Beidh searmanas oifigiúil ann ina ngearrfar an ribín ag láthair an fhoirgnimh nua agus beidh searmanas fleascleagain ann in éineacht le nóiméad machnaimh chiúin agus caoineadh píobaire ag an láthair ar cuireadh na ceannairí chun báis. Beidh oscailt oifigiúil Dhún Richmond ar siúl ar an dáta céanna ar ar tosaíodh na cúirteanna airm i 1916. Due to the small size of the venue, invites will be issued to relatives of the leaders only and the public will not be invited to attend. Official ceremonies will take place between May 3rd and 12th to commemorate the 15 executions following the Rising. The ceremonies will commence with the reading of the verdict of the court martial and a short narrative on the executed leader. This will be followed by a wreath laying ceremony. Mar gheall ar chomh beag is atá an t-ionad, ní thabharfar cuireadh ach do ghaolta na gceannairí agus ní bhfaighidh an pobal cuireadh chuig an imeacht. Beidh searmanais oifigiúla ar siúl idir an 3 agus an 12 Bealtaine chun comóradh a dhéanamh ar na 15 bhású a tharla tar éis an Éirí Amach. Cuirfear tús leis na searmanais le léamh bhreithiúnas na cúirte airm agus le cuntas gairid ar an gceannaire a cuireadh chun báis. Beidh searmanas fleascleagain ann ina dhiaidh sin. A ceremony will take place at Grangegorman Military Cemetery for British soldiers who died during the Easter Rising. Proceedings will include readings of historical accounts, music and prayer. A solemn wreath-laying will take place, followed by a minute of silent reflection and a piper’s lament. The National Flag will then be raised to full mast. Is trí chuireadh amháin atá an t-imeacht seo á eagrú. Beidh searmanas ar siúl i Reilig Mhíleata Ghráinseach Ghormáin in onóir saighdiúirí as an mBreatain a fuair bás i rith Éirí Amach na Cásca. Beidh léamha de chuntais stairiúla, ceol agus paidreacha mar chuid de na himeachtaí. Beidh searmanas sollúnta fleascleagain agus ina dhiaidh sin beidh nóiméad ciúin machnaimh agus caoineadh píobaire. Ansin ardófar an Bhratach Náisiúnta ar lánchrann. Children’s State Ceremonial, including the commemoration of children who died in 1916 and the launch of the report of consultations with children and young people on the future of Ireland. Children and young people will present the report of consultations to An Taoiseach and other Ministers on the policy changes they want for the future of Ireland. These visions of the future and suggestions for change in policy, as seen by young people, will act as a permanent legacy to the children of 1916, and be sealed and buried in a time capsule. A commemorative plaque and a tree will mark the burial spot. ​The Áras an Uachtaráin event will also see 40 children dressed in early 20th century garb, each representing a child of his or her age whose life ended tragically in 1916. The name and description of each child’s life will be read aloud and a candle will be lit in his/her honour while a visual installation displays photos of the individual children. Searmanas Stáit na Leanaí , lena n-áirítear comóradh a dhéanamh ar na leanaí a fuair bás i 1916 agus seoladh thuarascáil na gcomhairliúchán le leanaí agus daoine óg maidir le todhchaí na hÉireann. Cuirfidh leanaí agus daoine óga tuarascáil na gcomhairliúchán i láthair an Taoisigh agus Airí eile ar na hathruithe beartais a theastaíonn uathu do thodhchaí na hÉireann. Beidh na físeanna sin den todhchaí agus na moltaí le haghaidh athrú beartais, mar a fheiceann daoine óga iad, mar oidhreacht bhuan do leanaí 1916, agus déanfar iad a shéalú agus a chur i dtaisceadán todhchaí. Leagfar plaic chomórtha agus cuirfear crann ag an áit adhlactha. ​Ag ócáid Áras an Uachtaráin freisin beidh 40 leanbh gléasta i bhfeisteas ó thús an 20ú haois, mar léiriú ar bhuachaill nó ar chailín ar comhaois leo a fuair bás go tubaisteach i 1916. Léifear amach os ard ainm agus tuairisc ar shaol gach linbh agus lasfar coinneal ina (h)onóir agus taispeánfar grianghraif de na leanaí i suiteáil físe. There will be a visit to Pearse Museum, St. Enda's Park to commemorate Pádraig Pearse, the educationalist and literary figure. This event is an outdoor event and will incorporate music, readings, theatre and poetry. Tabharfar cuairt ar Mhúsaem na bPiarsach, Páirc Naomh Éanna chun comóradh a dhéanamh ar Phádraig Mac Piarais, oideachasóir agus fear litríochta. Is imeacht faoin spéir a bheidh ann agus beidh ceol, léamha, téatar agus filíocht i gceist ann. An event hosted by the President at Áras an Uachtaráin will take place to mark the conclusion of the State Ceremonial Programme. Beidh imeacht arna reáchtáil ag an Uachtarán ag Áras an Uachtaráin ar siúl chun deireadh an Chláir Searmanais Stáit a chomóradh. Find out what else is happening throughout 2016 by exploring the Programme Strands. Faigh amach faoi imeachtaí eile atá ar siúl i rith 2016 ach Snáitheanna an Chláir a fhiosrú.